Distillery: Bull Run Distilling Co.
Bull Run Distilling Co. has been making spirits since 2010, giving them a bit of seniority on the craft gin scene. The distillery is named for the watershed where the city of Portland, Oregon gets their drinking water, meaning that true to the gin’s name— there is a bit of Portland in this bottle. A mix of 10 botanicals, stated clearly on the bottle, Aria Portland Dry Gin opts for a more traditional spin on Northwest gin, built on a base of 100% grain spirit and bottled at a pleasantly strong 45% ABV. On the nose, pine-fresh juniper, with citrus and coriander playfully occupying supporting roles. There’s even a slight, warm hint of pepper in the low notes. The nose is classic in character, with a bright, nicely balanced freshness. I’d say it’s more Beefeater in its approach than it is Gordon’s; however, classic and inviting all the same. The palate is rife with fresh juniper, leaning towards the pine/green type of notes. Cardamom jumps out as a mid-palate background, lending some character but not stealing any thunder; citrusy coriander comes on late with a hint of pepper and orange zest. 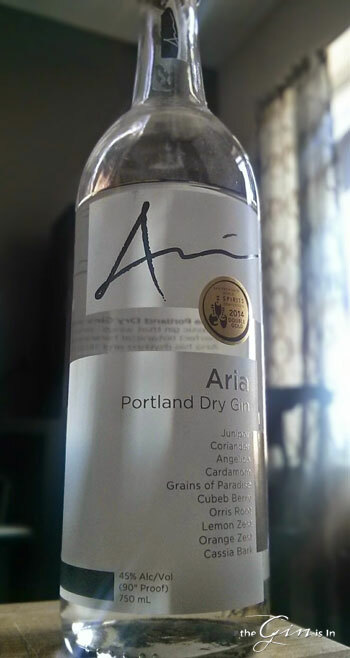 The finish of Aria Portland Dry Gin is quite long with coriander and juniper chiefly, but hints of cracked peppercorn as well. The finish continues like the dying embers of a campfire, with the embers briefly cast aglow with each inhale. Lovely stuff that warrants a closer look for just how it is neat. In a Gin and Tonic with Liber & Co Tonic Syrup, there was a rich, exotic spiciness that took over: ginger, orange zest, cinnamon all up front; the finish offers complexities of celery seed, pepper, and Meyer lemon bitters. Nice and spicy, good as a drink on its own, but the gin doesn’t come through as brightly as I might have expected here. I then tried Aria Portland Dry Gin in a Martini with Dolin Dry Vermouth. Again, I liked how a lot of the aspects of the spirit neat came through here, The Vermouth added touches of honey, chamomile which preceded the juniper and coriander build. The finish is complemented with some oxidized and grape spirit notes. A good cocktail. Finally, I put Aria Portland Dry Gin in a Negroni featuring La Quintinye Rouge Vermouth (really nice stuff, by the way). The amplified spiciness of the Vermouth added some color to the cocktail, filling in the spaces with some notes that Aria doesn’t feature. The notes I had don’t read like a list of botanicals as much as a colorful list of evocations: cinnamon bark, brown butter, vanilla cake with Gentian, Wormwood and Cinchona notes coming on towards the finish. Nicely balanced, and the gin adds to the complexities (you don’t get these same notes with just the Vermouth and Campari blend!). The finish is surprisingly short when compared to the spirit neat, but you’ll be thinking about the next sip, I think at least. Really well made, nicely balanced classic style gin. If you’re looking for proof that American distillers can hold their own with the elder statesman in the world of gin, pour yourself a cocktail with Aria Portland Dry Gin. Fans of contemporary styles will find it to be a bit more traditional than many other American distilled offerings; however, the balanced attention to juniper means this is far from a one-note juniper bomb. Perhaps the better metaphor is a garden of juniper bushes with a few other flowers added in for color. The best gin on the planet. This is a really great Gin, in a world where the contemporary style is commonplace for new Gins it is a pleasure to find one based on a more traditional style and and of high quality to boot. Made for Martin Ryan Distilling by Lee Medoff at Bull Run Distilling, this pedigree increases in kudos when you recall Lee was one of the original founders of House Spirits Distillery who make the equally superb Aviation Gin. I can’t wait to pick up another bottle of Aria Gin in the future. Thank you for the kind words and support! We are happy to hear that you enjoy Aria and would love to invite you (or any other fans for that matter) to drop into the distillery any time you’re in NW Portland for a personal tour. One thing we would like to clarify however, is that Lee Medoff is a very good friend of ours and he lets us use Bull Run Distillery for our production. But we (Erik Martin and myself, of Martin Ryan Distilling Co) make Aria Gin ourselves from start to finish. We are very passionate about the fact that we are distillers, hands-on from raw material to bottled product, and not merely brand owners who pay someone to do contract-production for us. There’s nothing wrong with contract production, its just that it isn’t what we do. We must also invite you to get out here to Portland so that we can show you around. Thanks for a great write-up! How’s the book coming along by-the-way? Ryan- Fantastically! Thank you for asking. The book is off to the presses, currently being run off for a September release! I’d love to swing by next time I’m up in your neck of the woods. This year I’m not sure where my travels might take me this summer/fall with the book release, but I will certainly be up there soon I hope. I’ll let you know!